It’s apparently a repeating pattern in my life that something that starts innocently is ultimately destined to end up hovering around the patently ridiculous. For instance, tell me after just having a baby that “it’s really cool being a parent”, and somehow I’ll deduce that if that’s true of only one kid imagine the benefit of having a whole horde of your very own! Which is how, ten years later, I’m having dinner nightly with four-fifths of a basketball team. Or, if you mention to me one day that you had the best ever pot stickers last night, twelve hours later I’m likely to be face down in the lo mein pan at the Grand Dragon Buffet, sweating hot and sour soup and with my pockets stuffed full of egg rolls* and mei fun noodles (which aren’t half as fun as they sound). Anyway, that’s how my quest to find two of Lay’s Flavor Finalist flavors got started: innocently, in passing. Last Friday evening, I happened to see on twitter talking about the Chicken and Waffles flavor. Ahem. Or perhaps a slightly more English-version of that. Regardless, that’s how I learned not only of the whole “Flavor Finalist” thing, but also that there were three flavors in competition: Chicken and Waffles, Cheesy Garlic Bread, and…duh duh duh….SRIRACHA! If you’ll recall, when it comes to Sriracha, I’m not exactly ambivalent. I like chicken and waffles. But chicken and waffles, the dish, isn’t nearly as great as it can be unless it includes a healthy sprinkling of hot sauce. Wait a second….Sriracha is hot sauce. I betcha those Chicken and Waffle chips’d go with them Sriracha chips just like peas and carrots, Mike and Ikes, M & Ms, or syphallis and penicillin. 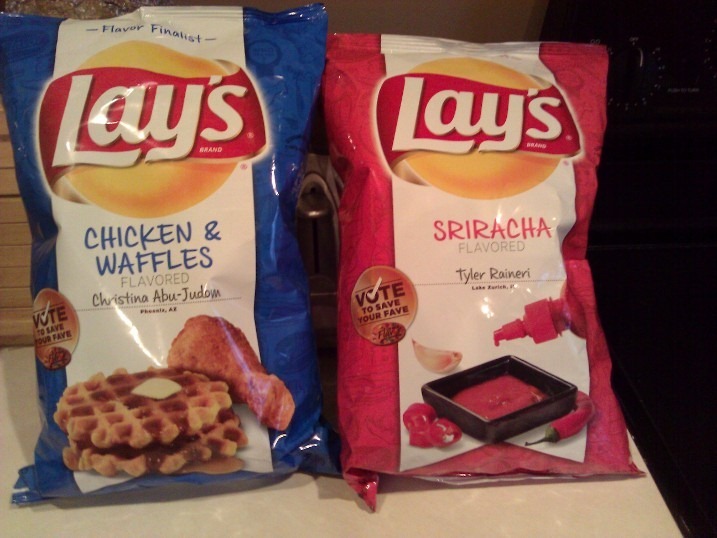 And thus, my weekend was committed to finding a bag each of the Chicken and Waffles and Sriracha chips. Of course, nothing that I think should be easy ever is. For instance, one would think that since Frito-Lay wants us all to buy at least one of each of three flavors available, they’d, you know, make the three flavors easily accessible. Afraid not. Sure, finding the Sriracha chips was no real feat. But the Chickeny Waffley ones were elusive. In fact, I’d all but given up hope for my quest until my sister-in-law happened upon a bag. Thankfully, thinking quickly, she immediately took possession of a bag and then raced through the store to the checkouts, like Indiana Jones with an ancient artifact and an angry native tribe hot on his heels. Well, at least that’s how I pictured it. Admittedly, it is much more likely that she picked up the bag and then proceeded to leisurely strolled through the remainder of store, marking items off her grocery list while a Muzak-version of Metallica’s “Enter Sandman” played overhead. The point is, I HAZ THE CHIPS! 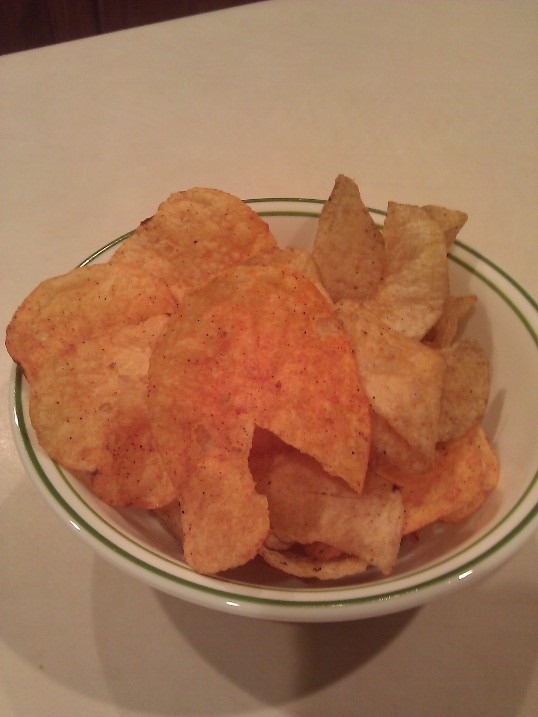 Now, finally, we arrive at the point of all this: the tasting of the chips themselves, both separate and together. Eating one was like spending an afternoon sucking on a tree in Vermont. Or, I’m guessing, anyway. What? No, I’ve never really done it. In fact, you can’t prove I’ve ever even been to Vermont. Let’s just forget I even mention it. Look, what’s that over there? Combined: As I said (way) above, my expectation going into this nonsense was that the Srirach-flavored Lay’s would be a nice counterpoint to the sweet-and-salty Chicken and Waffles, just the way I like real hot sauce to add a touch of spice to the traditional dish. What I found in the case of these potato chips, though, was the opposite. I don’t really care for the Chicken and Waffles chips enough to eat them in heaps with just a touch of heat here and there. And that’s good, too, because shoving just a single Srirach chip into your pie-hole when it’s already mulching up three or four of the Chicken and Waffle guys rides rampage over any and all other flavors in a wave of hot, tingly spicination**. That’s right, not even the Maple Madness can stand up to the fire of a single Sriracha-flavored Lay’s. Oddly enough, though, I was still able to make the combination a winner. Instead of eating the Chicken and Waffle chips with the occasional Sriracha spice-up, I instead decided to focus on the Sriracha chips. And when their tasty spiciness built up in my mouth to the point where I began having delusions of dairy cattle, I’d eat a Chicken and Waffle or two and cool down the fire with a more manageable micro-burst of maple. Well, for one, that I’m a nerd when it comes to setting my mind to things. But that was mostly already given. Two, there’s this: while I think Frito Lay largely missed the boat in making either of these Flavor Finalist chips taste like their real-world counterparts, that’s not to say you can’t find a way to enjoy them. More importantly, though, sometimes you just have to keep experimenting until you find the way that works best for you. And then you eat all the chips left over. *That’s totally an exaggeration. Nothing like that ever really happened. At least, not as far as you know. Or that the authorities could prove, anyway. **It’s a word today. Because I decided it was. For, you know, the reasons. ***I’m also more than just a leeeelte curious how they’re getting around that whole Sriracha trademark-thing on the bags, in ads, etc. But I’m not a branding or trademark attorney, and neither do I play one on TV. Mmmmm…om nom indeed! I wonder, as a lover of all things spicy (though not aflame), do you think I can find Sriracha in my local grocery store? I’m guessing no, since I live in Kansas where everything but corn and beef go to die. I’m going to try, though. You may have converted me!